The TV advertisements by lawyers always seem to be at the forefront of news about bad side effects of prescription drugs. Like buzzards circling over a carcass, lawyers are following the news that the diabetes medicine Avandia was associated with increased risk of heart attacks. The interesting thing is that drug companies sometimes market drugs which can cause harm to recover their research costs and make a profit. They figure that by the time the customers and the Food and Drug Administration (FDA) find out about the side effects, they will have made a lot of money even if they have to pay some claims for injuries caused by their product. Many of the late night commercials by lawyers are targeted at the following three drugs. 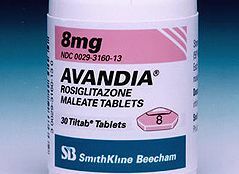 Avandia (Rosiglitazone) is used along with a diet and exercise program and sometimes with Avandryl and Avandamet to treat type-2 diabetes, also known as adult-onset diabetes. Avandia is made by the pharmaceutical company SmithKline Beecham which found as early as 1999 that the medicine posed risks to the heart, but the information was never made public. On May 21, 2007, the FDA issued a Safety Alert regarding Avandia. A study concludes that patients taking Avanida face a 43% increased risk of heart attack, and a 64% increased risk of dying from heart related (cardiovascular) disease, such as congestive heart failure. Reglan (metoclopramide) is used to relieve heartburn and speed the healing of ulcers and sores in the esophagus (tube that connects the mouth to the stomach) in people who have gastroesophageal reflux disease (GERD). Reglan is also used to treat nausea and vomiting, and to facilitate gastric emptying in patients with gastroparesis. Another use for Reglan is as a treatment for migraine headaches. On February 25, 2009, The FDA required the manufacturers of metoclopramide-containing drugs to add a "Black Box" notice warning about an increased risk of the development of Tardive Dyskinesia which is characterized by repetitive, involuntary, purposeless movements such as lip smacking, tongue protrusion, tremors, rapid eye blinking, and seizures. Accutane (isotretinoin) is used to treat severe acne that has not been helped by other treatments, such as antibiotics. Isotretinoin is in a class of medications called retinoids. Accutane has been linked to a variety of severe, life-threatening side effects including birth defects, depression, suicide, inflammatory bowel disease, Crohn’s disease, and ulcerative colitis. On June 26, 2009 Roche Holding AG, the manufacturer of Accutane initiated a nationwide recall of the popular medication after stating that they have awarded over $33 million in lawsuits directly related to bowel disease claims. Before taking any prescription drugs, we should always think very seriously about their side effects and whether we really need the medicines. It seems that sometimes the cure is worse than the disease.